0, 3, 6, 12, 24, 48, 96, 192, 384. When it was initially published, it was found that this law correctly predicts the distances of all known planets from Mercury to Saturn. It also correctly predicted the (then unknown) locations of the asteroid belt and Uranus, but not for Neptune or Pluto (Fig. 1). 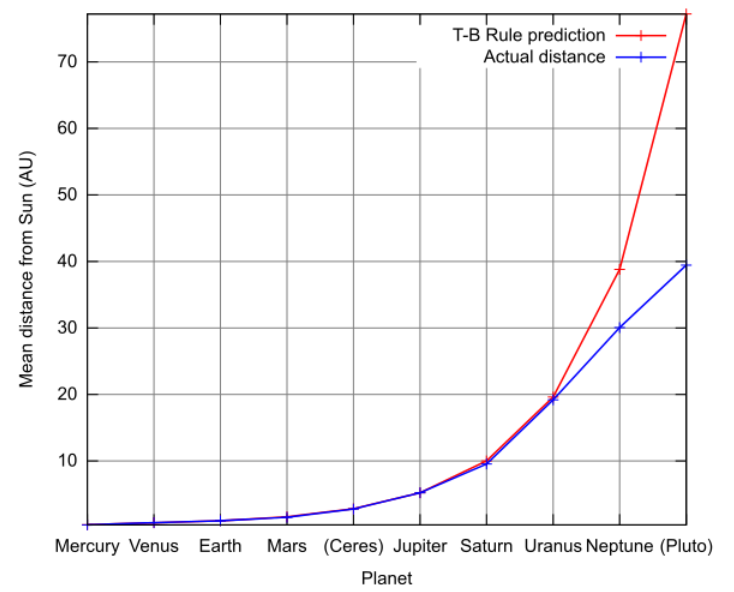 The Titius-Bode relation has been the subject of much speculation, but the so-called “law” is now largely thought to be a mathematical coincidence rather than an actual physical law since it is not well physically motivated and fails to apply to the outermost planets in our solar system. Even so, there have been suggestions that this relation is a mathematical result of orbital resonances and gravitational interactions within multi-body planetary systems. It is difficult to say whether the Titius-Bode relation has any deeper significance just from looking in our own solar system. However, the plethora of exoplanet discoveries over the past several years allows for a larger sample of planetary systems in which we can examine this relation. In the four years that the Kepler mission has been active, over 3000 extrasolar planetary systems have been discovered. About 1/5 of these planet-hosting stars are believed to host multiple planets. 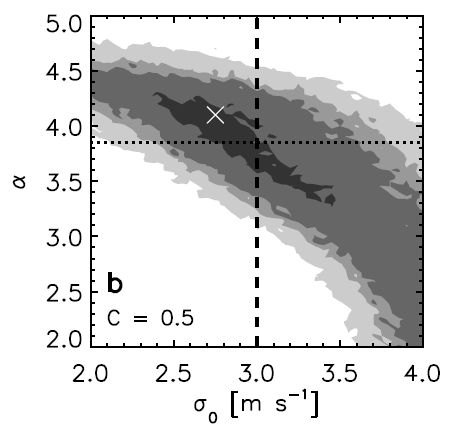 In this paper, the authors use Kepler data to see if a generalized Titius-Bode relation holds for extrasolar multi-planet systems. This analysis is based on a previous paper by Bovaird & Lineweaver (hereafter BL13), in which the authors attempt to test the Titius-Bode relation on known extrasolar planetary systems. BL13 predicts that these extrasolar systems should follow a Titius-Bode relation (one that is modified and generalized from the relation that applies to the solar system), and that there may be undetected planets that fit into this relation. Specifically, the paper predicted the existence of 141 additional exoplanets in 68 multiple-exoplanet systems. 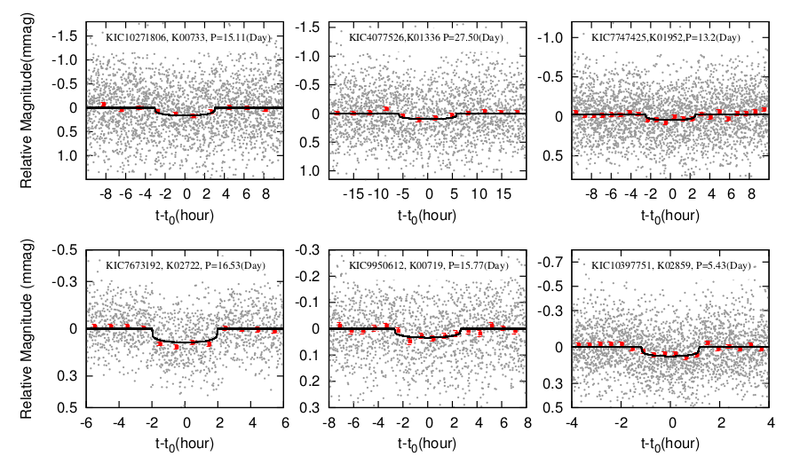 The analysis in this paper focuses on Kepler data taken over a 100 day time span. From examining the light curves from 56 exoplanet systems, the authors only managed to detect 5 of the predicted planets. That is, a majority of the planets predicted from the modified Titius-Bode relation were not found. Fig. 2: Light curves showing transits of the newly discovered exoplanets found using a generalized Titius-Bode relation. It is also possible that there are observational biases that prevent these “missing” planets from being detected. For example, it is assumed that most of the planets in a planetary system will lie roughly in the same orbital plane. This is not necessarily true, and any strong deviations in orbital inclination angle will reduce the number of expected observable transits. Additionally, planets could also avoid detection due to their small size and lack of observed signal in their light curves. 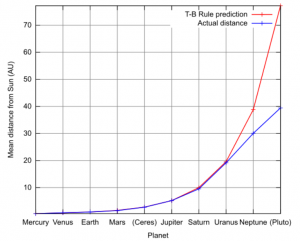 After taking these factors into consideration, the authors predict that they should find roughly 15 planets that obey a Titius-Bode relation. The authors ultimately only detect only 5 of the 141 predicted planets. Even after correcting for observational biases, this number is significantly smaller than expected. The authors conclude that it is questionable that a Titius-Bode relation will hold for all extrasolar planetary systems. Even if the Titius-Bode relation turns out to be a mathematical oddity, it is still insightful to see if our own solar system shares any common characteristics with any extrasolar counterparts. The Titius-Bode rule: Ring structures in planetary systems are formed by a similar mechanism. In musical harmonics, the pipe lengths are octaves (1/2^n) below the fundamental, and linear (n) above the fundamental. Saturn, Uranus, Neptune and Pluto lie on distances 1, 2, 3 and 4 within plus minus a few %. Neptune represents the fifth (3:2). Both it and Pluto are exactly where they are supposed to be. This means that Saturn (for whatever reason) is the fundamental. This was proposed by several scientists in the 80s, most thoroughly by Sevinson and Kotov. Kotov related it to a solar pulsation of 160 minutes, which is the travel time of light from the Sun to Saturn and back. The Sun pulses at a 160 minute interval. Check it out.